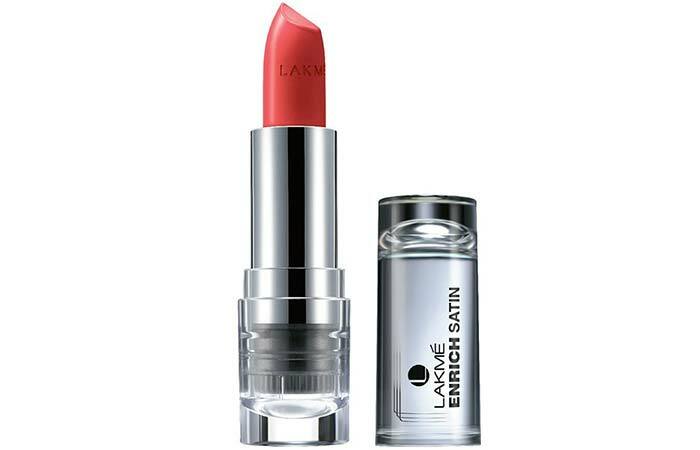 Lakme Enrich Satin Lipstick Review And Shades: How To Use It? There’s nothing quite as tempting as rows filled with a multitude of tubes of lipstick in the beauty aisle of your department store. If you’re already a lipstick fanatic, you must’ve heard about the famous Enrich Satin range of lipsticks from Lakme. 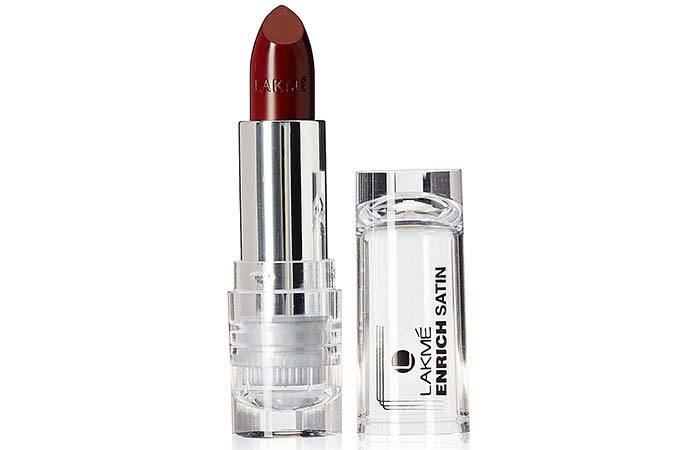 Lakme has revamped this range with exciting new shades and fancy packaging. 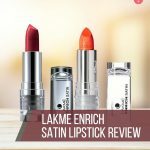 If you’re curious to find out how these lipsticks perform before you purchase them, we tried some of the shades and have put together a full-fledged review of these lipsticks from Lakme. Read on to find out how these fared in our review! With the added goodness of Olive Oil and Vitamin E, keep your lips feeling satin smooth all day long. Steal the show with an intense, vibrant pout! Brought to you from the Lakme Classics range, these long-lasting lipsticks are available in versatile shades to suit every Indian skin tone. 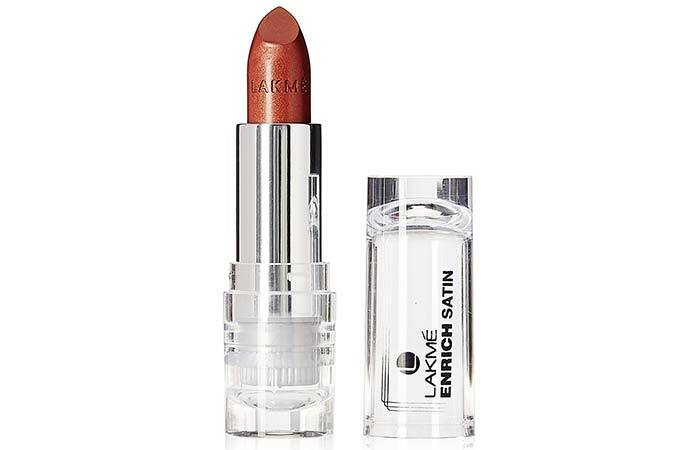 From the age-old boring maroon lipstick tube, the packaging has been revamped to a see-through case. Its transparent cap helps in locating the specific color in my lipstick stash. The shade’s number is printed at the bottom of the case on a sticker. Coming to the case, it’s fairly sturdy, and it locks tightly, making it easy to carry around in your purse. The lipstick case comes in an outer cardboard carton. However, there’s no complete ingredient list mentioned anywhere. Octyldodecanol, Sodium Laureth Sulfate, Ethyl Cellulose. Looking at the wide array of shades available in this range, I was extremely keen on trying some of these out, especially because I was attracted to their super-wearable satin finish. I picked up two shades – P143 and R365 – the first one is a peachy coral and the second is a warm orange. Here’s what I observed! The texture of the lipstick was extremely smooth, and it applied easily without tugging or pulling on my lips. As it leaves you with a satin finish, these are quite moisturizing – so you don’t really need to go in with a lip balm before applying the color. 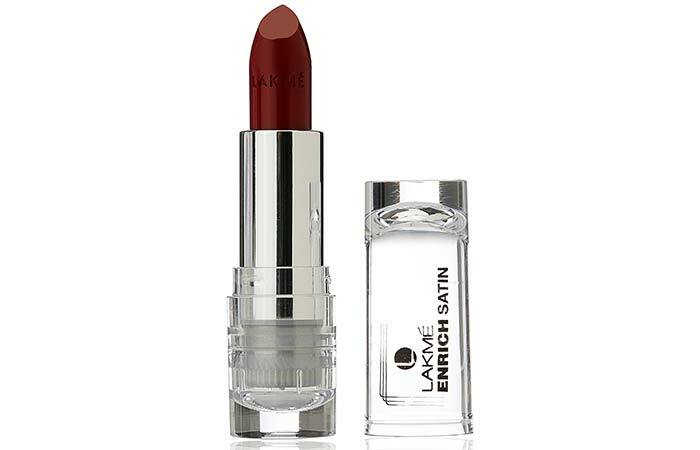 It keeps the lips hydrated through its wear time and also plumps the lips to a certain extent. 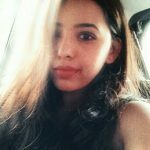 The fragrance is the typical Lakme fragrance – a sweet floral smell that fades after some time of application, but if you’re sensitive to smell, you might find it a little nauseating. The pigmentation of these lipsticks is so impressive! These are highly pigmented, and one swipe gives you a strong, opaque payoff. 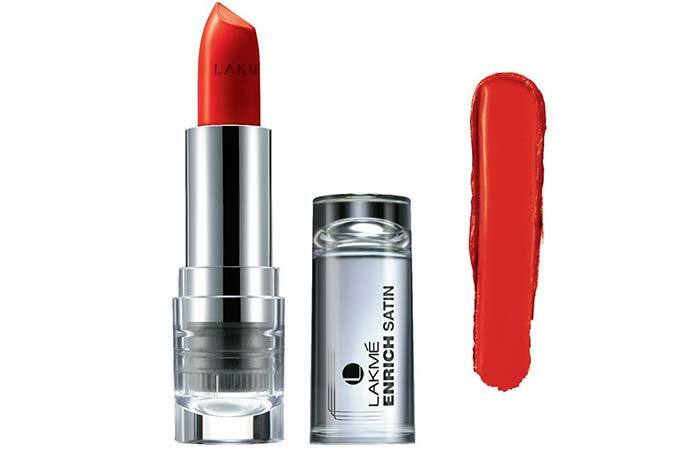 You can increase the intensity of the color according to your preference by carefully layering the lipstick. I must say though; it has a tendency to transfer onto cups and glasses, so blotting is a must. However, these don’t feel sticky or heavy on the lips and are easy and comfortable to wear. These lipsticks stay on for a good 3-4 hours while subtly fading as time passes by and also with the intake of snacks. However, they leave behind a good stain which stays on until you actually remove it with an oil-based makeup remover. Touch-ups aren’t an issue as these are very simple to re-apply on-the-go! These are some of the most popular shades available from this range. Read on to find out how each one performs. This shade is a deep plum pink with an intense color payoff. It instantly perks up your face and suits most skin tones. It’s perfect to wear during the day. 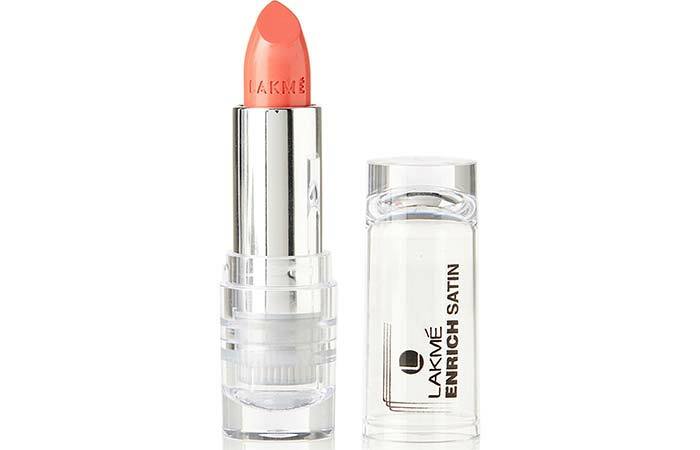 This one’s a very pretty peachy shade and is perfect for the summer or spring. It also has very fine shimmer and adds glamor to any look that you’re pulling off. If you like soft pinks, this one’s a sheer pink that is perfect for daily wear. It leaves your face with a dewy, dreamy look. Also great when you want to go in with the no-makeup makeup look. This one’s a beautiful coral pink shade, and it’s so pigmented! It’s a great pick for the summer. 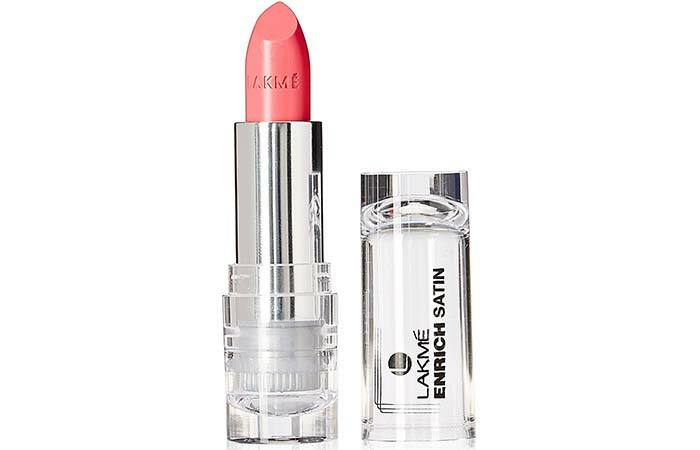 If you’re someone with fair skin, this might just become your new favorite coral pink lipstick! P149 is a bright, flashy fuchsia pink. It has fine shimmer particles which are only visible on the bullet and not when you actually put it on – which is the dream. This one’s a sultry plum color with fine shimmers in it. It’s perfect for evening wear and special occasions! It looks particularly fabulous on dusky skin tones. 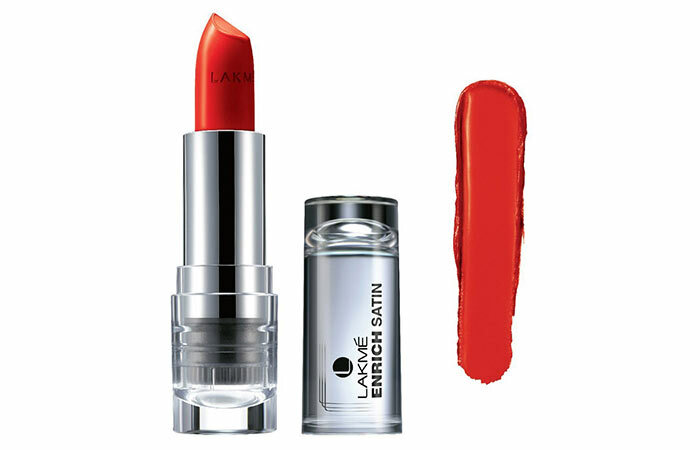 P158 is a deep coral shade with a lot of pink undertones. It’s pretty much that ‘carrot red’ shade, and it looks so feminine! You can wear it during the day to brighten up your face on lunch dates and movies! If you like a good old Barbie pink, this one’s for you. It’s slightly cool toned and can washout your medium skin tone. This is best suited for fair skin tones. This is perhaps the prettiest pink from this range. It’s a rosy pink shade and is so great for daily wear. It’s free from shimmers and will flatter all Indian skin tones well. P164 is a vibrant orange-red with a lot of pink formulated in it. It goes well with lighter skin tones. Want to get the hottest pink for this summer? 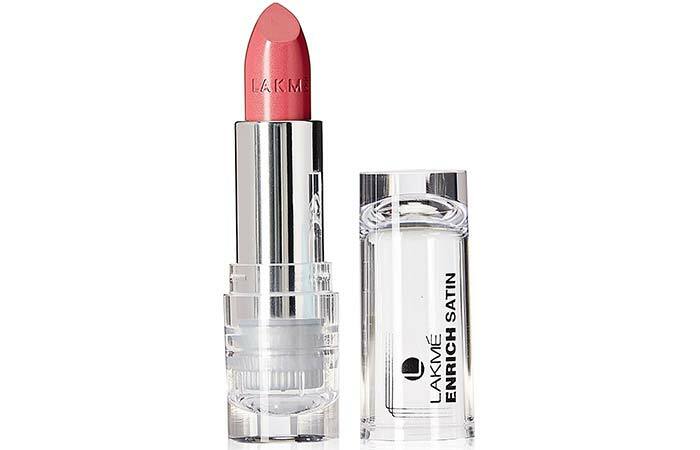 This one’s a bright, coral pink with the right intensity and warm undertones, making it ideal for Indian skin tones. This color does not have any shimmer in it, making it all the more perf! This is a bright, vibrant pink with strong red undertones. It’s a very festive color and is great for evening wear. Any skin tone can pull off this color, and it will instantly amp up your look. This is a pretty pastel pink shade and will suit fair to medium skin tones. The only downside is its shimmer that tends to transfer around the lips. A rose pink shade that does not contain any shimmer! It will complement every skin tone beautifully and will make you look fresh and glowing. Fancy a deep maroon with warm undertones? This is your shade! It’s very versatile and will flatter all skin tones well. It’s a hot shade for fall and winter. This one’s a deep blood red, and its pigmentation is insane! It can also be used as a stain. This is a must-try! R359 is a cherry red and looks beautiful on most Indian skin tones. It’s great for parties and special occasions. 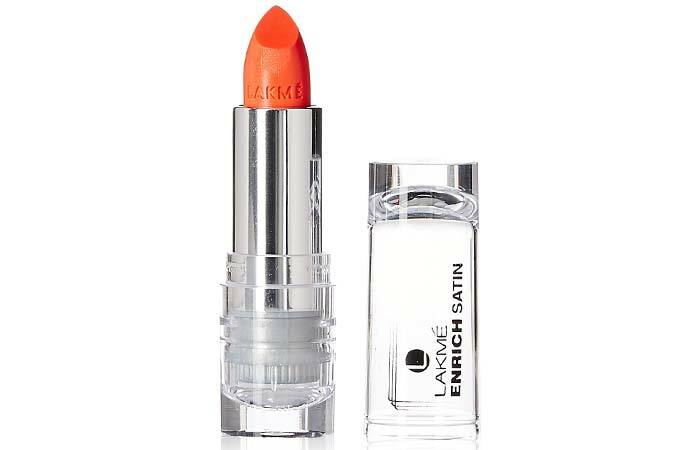 An orangey-coral shade which isn’t too bright and looks stunning on fair to medium skin tones. This one’s a cool-toned brown shade with purple undertones. It’s not for everyone, but if you’re looking to try something new, this could be it. It’s suitable for fair skin tones as it might washout medium skin tones. If you like a good old light brown shade, this shade makes for a good neutral color. This is a metallic copper shade and looks different in varied lighting conditions. If you’re a fan of shimmery lipsticks, this is something you can try out. Stretch your lips and start from the center moving towards the corners of your lips. Blot the lipstick with a tissue. For detailed explanation, read the lipstick tutorial. Yes! I would repurchase this product, and I highly recommend you to try it if you like the whole semi-matte, satin finish. It will give you a long-lasting color without drying out your lips. Although this range has its flaws, the most significant being they tend to transfer – what you should put into view is that all satin lipsticks aren’t entirely transfer-proof. 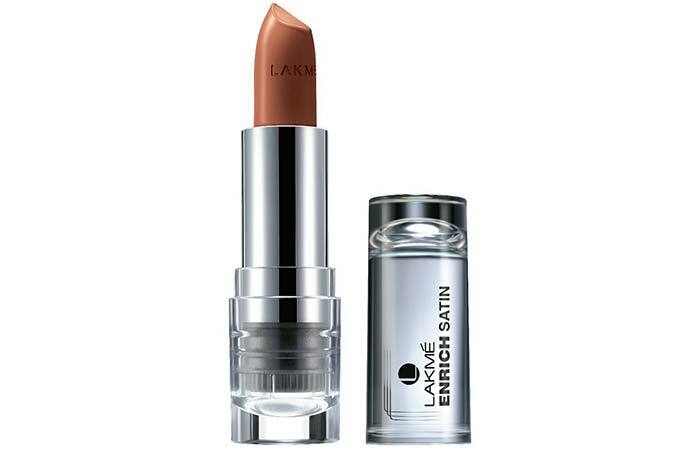 The Lakme Enrich Satin Lippies easily fall into the category of the best affordable lipsticks in the Indian market with a whole lot of shades to choose from for every skin tone. There’s something incredibly attractive about lipstick that slips on like satin and sets like velvet on the lips. 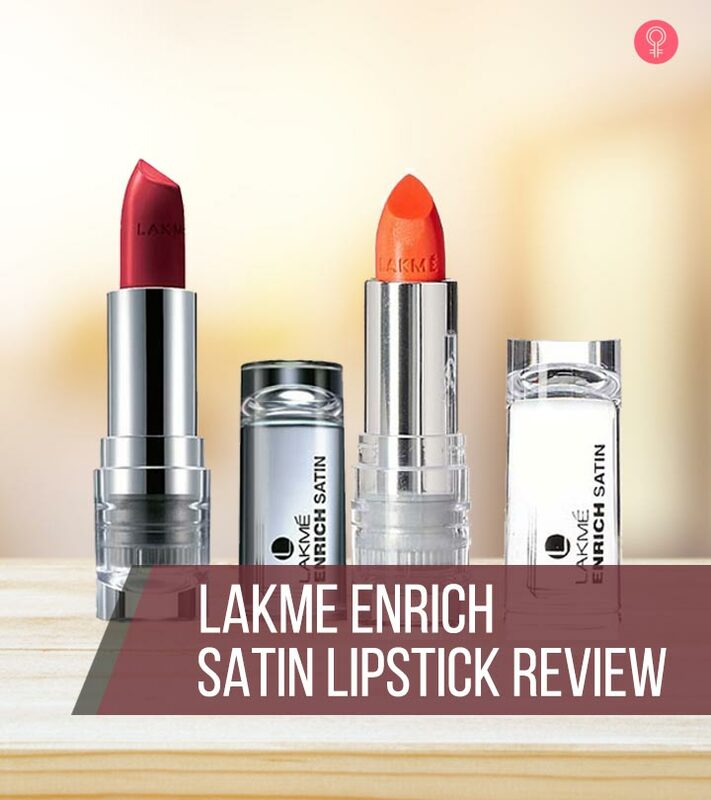 That was our elaborate review of the Enrich Satin Lipsticks from Lakme. Did you try any of the shades from this range? What did you think? Let us know in the comments section below. 15 Amazing Blue Lipsticks That Add Dramatic Look To Your Lips!